Well ! We have now reached the chapter of the final approach ! This one will help you control your speed and your trajectory on a final approach course, which is very important to perform a good landing! Oh no! Here are again some new principles and techniques to learn? Well ladies and gentlemen, don't panic! This chapter is only going to remind you what you have just seen. Yes, as I said in the introduction, I will not explain new notions to you here. On a final approach, you will have to extend the flaps, maintain a specific power and speed settings, and follow a 5% descent slope leading to the runway (instead of following a horizontal course to stay leveled). All the techniques and principles seen previously remain useful. The only difference is that you will have to estimate the position of the 5% descent slope yourself to follow it (the first times, your instructor will show you where it is located). Case n°1 : You are below the slope with too much speed. So you have to use the speed to go back on the slope. 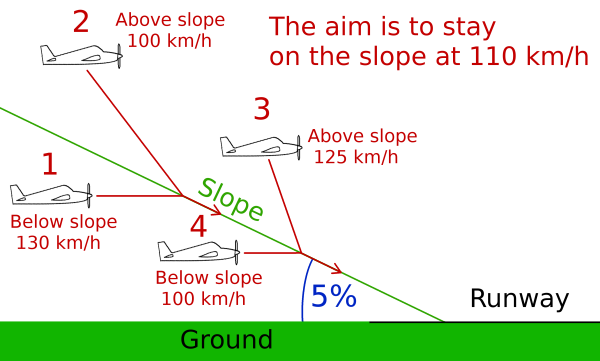 Case n°2 : You are above the slope with a too low speed. So you have to get your speed back by descending on the slope. Case n°3 : You are above the slope and you fly too fast. So you have to reduce your power settings to reduce your energy (Speed plus altitude) to go back on the slope. When back on it, don't forget to put back the normal power settings. Case n°4 : You are below the slope and you go too slow. So you have to set more power than the one normally required to gain enough energy to go back on the slope and get back speed. Then go back to the normal power settings. Et voila ! It was the same thing as the previous chapter, as promised. Let's not linger here and go to the next chapter right now, this one will get us into a fussy topic : the flare !